Seriously, this looks great! Really love how you did the heart (still in Valentwines mode lol), the rest is fabulous too! Really like how you kept it all in the black and white tones! Classic colors of Valentine and a classy tag! A lovely take on the challenge, beautiful, Pamellia. Love your magic touch to it. WOW! Pamellia, this is fabulous. Love, love, love the Red heart and the little charm with the birds, a wonderful creation really stands out against the script. LOVE how you changed up the design for Tim's tag this month. The black and white with the pop of red is fabulous! Love your fabulous tag, awesome details as always. I like your version! 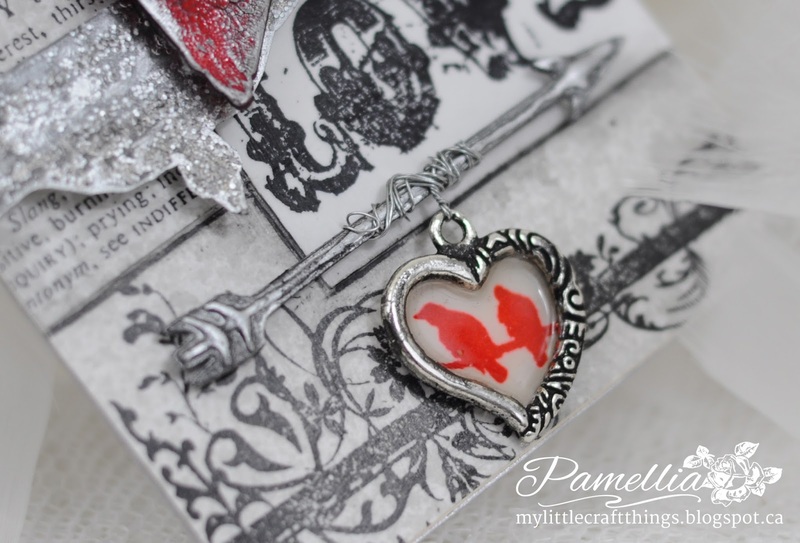 Wonderful stamping and design, and the little heart charm is adorable! Wow love your take on Tim's tag for Feb. Like how you chose B/W with a touch of red. I own both those sets but would never have thought to use them to make a collage . Like the 2 little birds in the heart and how you wrapped the big heart with twine . This is a winner in my eyes. Well, I for one much prefer your tag. So much prettier than Tim's. Fabulous design my dear. This is so beautiful Pamellia. I love your design using such gorgeous images, the red heart looks amazing and the heart charm with the birds is such a lovely touch. I don't want to sound like a heretic but I really like your tag better than Tim's. I love the crackled heart and the little charm is so charming - lol. I also love that you kept it to black and white with those little pops of red. Fantastic tag.The white black and red is striking and Iove your take on the challenge.Love what you did with the heart(s). 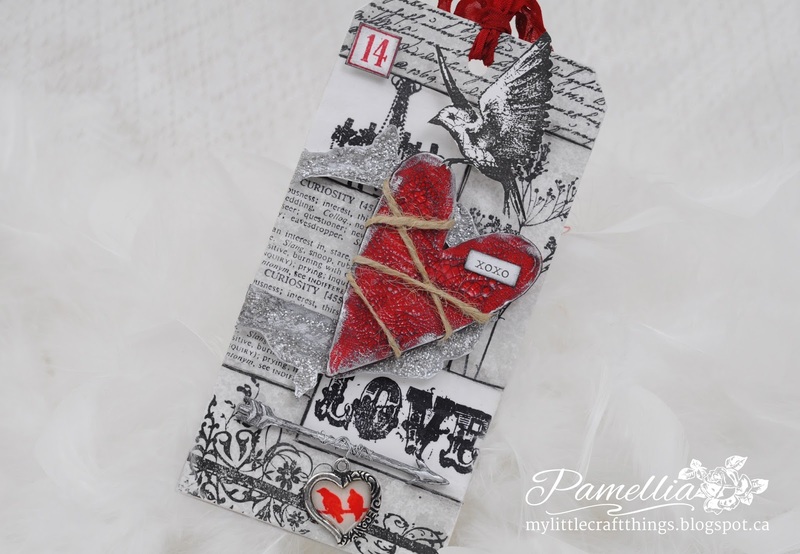 Oh, Pamellia, I think this is the most beautiful version of Tim's February tag for this year by now! i love the black&white color combination with a touch of red! Stunning! I feel I should make a doctor's appointment after the holiday, since I I get uncontrollable drooling when visiting your blog. If I have to be afflicted with something, I'll take it!! Such wonderful fun and creativity in your makes that emit inspiration and beauty. Nicely done Chica!! This is a fabulous tag Pamellia, such a brilliant take on Tim's - the black and white with the contrasting red is gorgeous. What a wonderful tag Pamelia, a different set of colours from your usual but gorgeous just the same, love it! 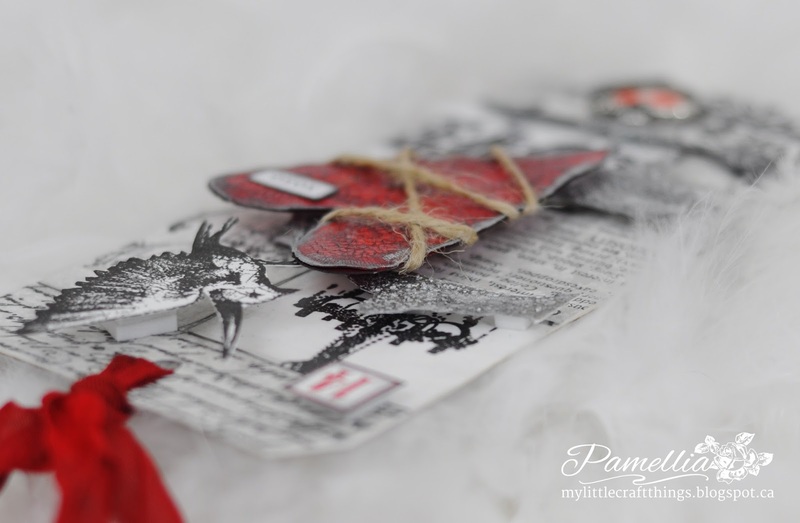 I love how you layered all the elements on your tag, and the charm is fabulous! Thanks so much for playing along with us at ATSM this week! Stunning tag. Black, White and red just have to be right. WOW what a gorgeous tag Pamellia! I love the colors and the beautiful crackled heart!! Your designing is always ace. The touch of Pam is perfect, wonderful tag Pamellia! Well, sorry to say, once again I prefer yours to Sir Tim of Distressville. Yours looks more organic in design so once again, don't tell Tim! Its a cracker Pamellia. Pamellia!!!!! Simply A M A ZZZZ I N G !!!!!! We are definitely going to have to have Tim sent in for that CAT scan if he doesn't chose yours as his numero uno winner! What is NOT to love about this piece??? You have stolen the show, for sure! I love that glittered what-cha-ma-call-it! And the sweet RED birds!!! Simply amazing....oh I said that already! I'm at a loss for words! Great home supercala frag a lis tic run, my friend! And you would not believe how I found out about this gorgeous creation! I would like to be a guest in your head for just one day! Oh, now I have to go make something! What inspiration! Hugs! LOVE your take! LOVE the heart! Beautiful tag Pamellia! Love the crackled heart! Great take on Tim's challenge! A fabulous take on the February tag. I love that you have made your own collage papers using stamps and your Black, White and Red colour scheme is brilliant. Sally.x. Gorgeous, brilliant, fantastic! you clever girl, love it to bits. What a great take on Tim's tag! love that bird and your twine wrapped and crackled heart! I recognize your style but there' s always something new to discover and the whole is in a such harmony! I love your heart! Beautiful version of Tim's tag! OH! will you STOP it, I can't stand this holding my breath every time I visit, the breaths are held longer and longer each time, I'll be super champion deep sea diver at this rate! A really Truly beautiful tag and, I believe you have been told this before, better than Tim's. GORGEOUS. Beautifully done ... You make it look so simple ... Love the colours and that amazing heart! Gorgeous tag - love all those different textures! Thanks so much for joining us at ATSM this week! Just stunning! I love looking at all of your beautiful details. I love the pop of red on this tag, and the texture of the crackle paint. Absolutely gorgeous tag I am glad that you put your own creative touch to it Pamellia I really love the little embellishments and the paper a super make. Such a beautiful tag - love the crackle finish on the heart. Great work. Thanks so much for playing along with ASM this week! I keep saying that I will join Tim's monthly tag challenge, but I never do - mostly because I can't seem to find the right dies/stamps. What do you think - is this good excuse to do some shopping? ;) I love the splash of red on your tag - looks amazing! Fab work! Your tag is just beautiful and you have added so many perfect details. This is fantastic! (Can't think what you were worried about!!) 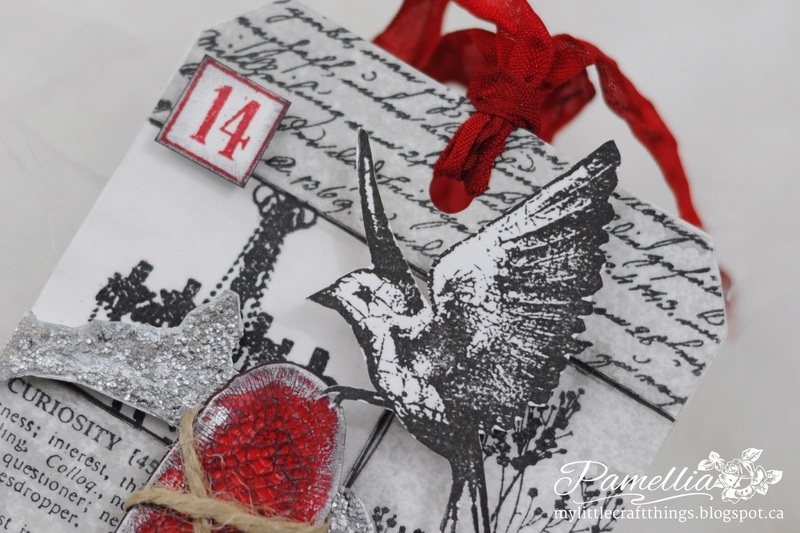 I love the monochromatic look with those fab accents of bold red, the pop of dimension for the bird, and the crackly twine-wrapped heart - fabulous take on the Feb tag! You are brave! I wish I could make things more my own style! A gorgeous tag! Thank you for sharing with us at FSC! 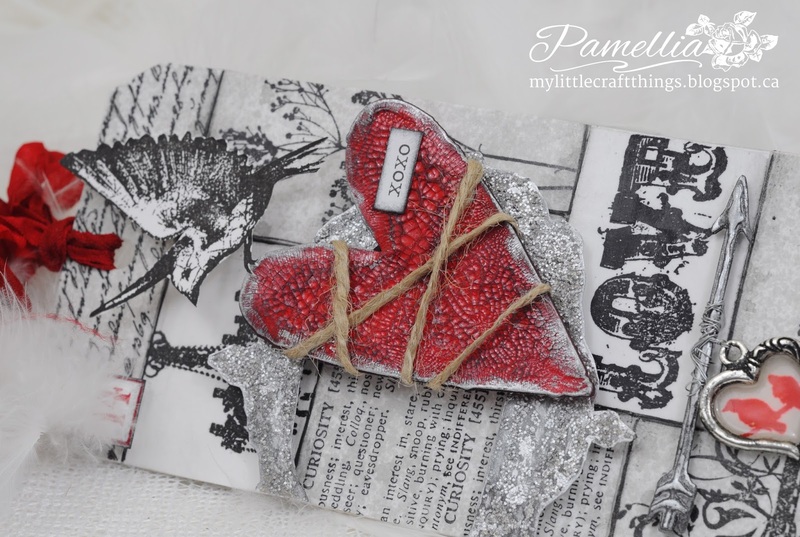 A fabulous interpretation Pamellia, a gorgeous Palette and superb heart. Congrats on your Tim win. Great tag Pamellia. Congratulations on being a winner. Yours is still my favourite. hmmm...not sure where my comment went, but I'll say it again! I'm doing my Tim Happy Dance for you! I'm so proud of you! Hugs! I love your interpretation of Tim's tag. The crackle heart is just perfect. Congratulations! 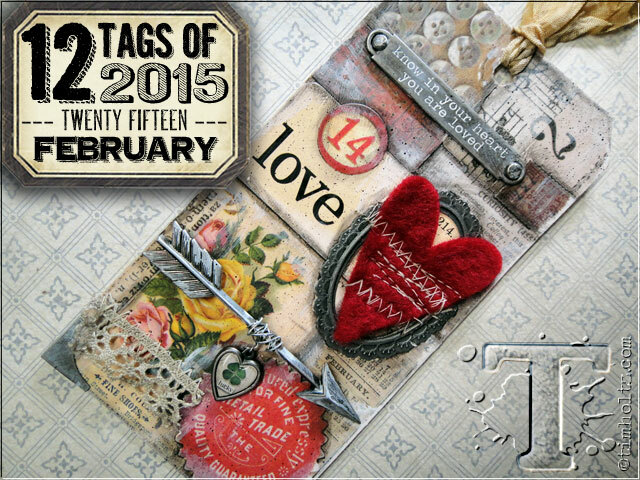 Love the black and white color scheme on your February tag. Congratulations on your win! Hi there!!! Huge congrats on February win at 12 tag of 2015!!! I saw it, but was at work and then just slipped my mind somehow !?!? So I am finally here to give you a huge cyber hug!!! Can you feel that squeeze??? HuH?? ?